For many, the metropolitan nightlife is a novel opportunity to get out of the routine, have fun, and let go for a little while; partake in a contemporary lifestyle amongst the masses. Get lost and imbibe of the bustle and activity of the vivacious city. Many artists have found that, ironically, the crowds of people in urban settings often allow for the most privacy. 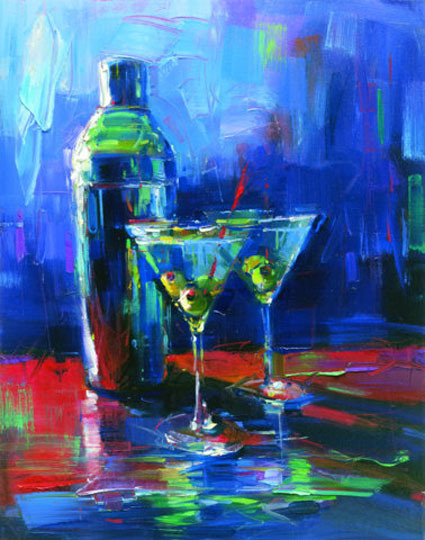 Michael Flohr’s Martini for Two is all about sharing a treasured moment of conversation over a favorite drink. The single focus upon a martini shaker and two glasses, Flohr creates a sense of intimacy that can only be found inside a crowded bar. Over time, Flohr’s style has grown and developed; his loose brushstrokes and vibrant colors evidence a trained eye that knows just how to translate a single moment onto canvas. He elevates these moments with every color, and allows us to appreciate the little things that can make all the difference. The best memories in life are made when we share a hour or two with someone we care about. So sit back, relax, and order a “Martini for Two”.